EFFECT: A spectator is handed one of the magician's business cards and is invited to write any number from 1-52 on its blank back. The card is slipped into an envelope which is left in view on the table. The performer says that he will now make a prediction by writing the name of a playing card on the back of a second business card. Having done this, the business card is slipped into the envelope with the first business card. Taking out a pack of cards, the deck is shuffled and the spectator, for the first time, reveals her chosen number. Let's say it is 20. The performer deals down to the 20th card which is placed on the table. Picking up the envelope the business cards inside are removed. The first one is shown to indeed have the spectator's number 20 written on its back, and the second business card is shown to bear a card name - for instance, the 7D. When the playing card dealt to is turned face up, it is the 7D! COMMENTS: This routine is one of those featured on my Envelope Magic DVD, but this is the first time it has appeared in print. The routine uses the Utility Switch Envelopes, but it uses it in a very different way. Instead of the gimmick helping to permanently steal away a card, it is used instead as a means of getting information that is written on a card. The principle could, I'm sure, be used in other types of effect if you put your mind to it. REQUIREMENTS: 1. A Utility Switch Envelope. 2. Two decks of cards. 3. A pile of your business cards. SET-UP: Take one of the decks and extract all the Diamond and Club cards. Arrange them into a pile with the A-K of Clubs face down in numerical order (Ace on top), followed by the suit of Diamonds in face down numerical order from A-K. Take the KD and make it into a thick card by sticking a Joker to its rear. Now assemble a random selection of 26 indifferent cards. You can use some of the Clubs and Spades cards from the first deck, but you might want to sprinkle in a few Clubs and Diamonds cards from the second deck just so that the 26 cards look a natural mix. Put this 26 card mix under the stack and slip the deck face down into a card box. Have a pile of your business cards, the Utility Switch Envelope and the pen collected together with the special deck. PRESENTATION: Bring out your business cards and holding them writing side upwards, spread them to show what they are and then square the pile in your left hand. Flip over the top card to show its blank back as you say that you are going to get a spectator to write any number from 1-52 on the blank back of one of your cards. Flip the card over again and then peel it off and hand it plus the pen to a suitable spectator so that she can write her chosen number on the card back. Emphasise that the number is to remain totally secret so that only she knows what it is. With the pile of business cards still in your left hand, pick up the envelope and using the switch move described earlier in this book, take the business card and apparently slip it number side downwards into the envelope which is placed on the table. Of course, thanks to the way the envelope works, the business card the spectator has just written on will end up back on the top of the pile of cards in your left hand and the envelope placed on the table will be empty. One small but important handling point here. When you take the card to slip it into the envelope, make sure that the orientation of the printed business information on the card is the correct way round so that when it is secretly added to the top of the business card pile, the writing is facing the same way as the cards already there. Otherwise it might reveal that a card has gone on to the top of the pile to a sharp eyed spectator if the writing is suddenly pointing in a different direction! You now explain that you are going to write a prediction on the back of another one of your business cards. As you say this you double lift the top two business cards on the pile, flipping them right over to reveal a blank back. Tilting the pile back towards you a little with your left hand, use your right hand to slide off the top business card in order to freely display it. When you do so, the number that the spectator wrote on the back of her business card will be facing you on top of the pile. Remember the number. As soon as you have seen the number, replace the business card in your right hand back on top of the pile with its blank side uppermost again, and take up the pen as you explain that are going to write the name of a playing card as a prediction. Now at this point you need to do some simple mental maths. If the number chosen is between 1 and 26, you will easily be able to work out which card from your stack falls on that number. So if the number is 20, you take 13 from it (that accounts for all the suit of clubs) which leaves 7, so the card to write is the 7D. If the number is between 27 and 52, you subtract 26 from it first and then work it out from there. So if the number was 35, you take away 26 which leaves 9, so the card to write is the 9th one in your stack, the 9C. Having written the correct card name on the back of your business card, place the pen down and then using your right thumb at the short edges nearest you, lift up slightly the top two cards as one and then slide them forwards for about a third of their length. As soon as you have done this, twist your left hand palm down so that the outjogged card(s) are facing to the right with the business information visible, and regrip the two cards as one with the right hand at this exposed end pulling them away from the pile. Place the balance of the pile down and then use the left hand to pick up the envelope from the table. With your right hand slip the two cards as one into the envelope, making sure that you angle the card (s) upwards a little as they go into the envelope so that they end up in the genuine pocket of the envelope interior and are not introduced into the slit (although if that happens by accident it doesn't matter too much provided you don't push them down so far that they appear outside at the bottom of the envelope!). The envelope is put back on the table in view. By the above handling the envelope has enabled you to get the information about the number chosen by the spectator and then that business card plus your prediction business card have both ended up back inside the envelope where they should be leaving no clue that the spectator's card ever left. I think this is a pleasingly subtle use of the envelope's potential. You now remove the deck from its box and flip it face up. Casually spread cards from the bottom half of the deck as you comment that one of these cards is now going to be removed from the pack. Having shown apparently that it is a regular mixed deck, square the cards and turn them face down, holding them between the hands ready for an overhand shuffle. You are now going to do a false shuffle that will leave your stack undisturbed. With your right hand cut off just under half the cards from the bottom of the deck. Lift them up and use the left thumb to drag the top card off the right hand's pile and onto the top of the deck in the left hand. As you do this make sure that this first card is injogged. Without a pause shuffle the remainder of the cards in the right hand onto the injogged card in several small clumps until all the cards are exhausted. 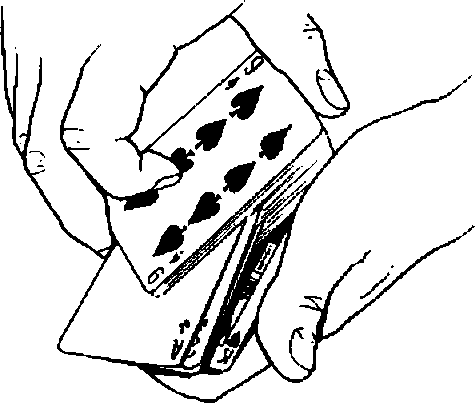 The empty right hand now approaches the deck again and with the thumb at the rear short edges and the fingers at the outer, the right fingers and thumb start to square the cards. As the cards are pushed together, the right thumb pushes to the left on the injogged card. This means that by the time the cards are squared the right thumb will be holding a large break at the inner short end between what was the injogged card and the original top of the deck. The right hand immediately lifts up the complete deck and shuffles off in small clumps all the cards above the break, finally dropping the remainder of the deck as one lump on top. What this does is to shuffle some of the indifferent cards from the lower part of the deck around the stack, and the finish the stack is still at the top and in the same order. You now ask the spectator to reveal for the first time the number she chose. If her number is between 1 and 26, you simply count down to that card, placing the card that falls on her chosen number to one side and in full view. If you know that her chosen number is between 27 and 52, once you have done the false shuffle and squared the deck in your left hand, use your left thumb to riffle down the top left corner of the deck until you feel the think KD spring past. Immediately do a complete cut at that point. This will take your stack to the bottom of the deck leaving all 26 indifferent cards on top and thus put the cards in the right place to match your prediction. All that remains once the card at the selected number has been taken out is to place the deck to one side and pick up the envelope again. Tip out the two business cards from inside, bowing the envelope open with the slit shut to show it is otherwise empty. Turn the business cards over to confirm the number the spectator wrote and then show the prediction card name that you wrote on the other card. Flip over the selected card to reveal it matches.